Whew…yesterday was a busy, busy day for stamping at my house! I had two classes making cards for “Those Wonderful Women” in our lives. 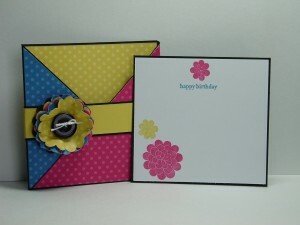 One of the cards we made was targeted for younger ladies but with the bright, happy colors, it could be for anyone. I started with my Brights Designer Paper Pack and chose the polka dots paper in Melon Mambo, Pacific Point and Daffodil Delight. The Basic Black really makes those colors pop so that was my base for the card. The finished card is 4 1/4″ x 4 1/4″. Just perfect for tucking in a gift bag or inside a present box!! I used my Scallop Circle punch to create the flower on this. Simply punch out one Basic Black scallop circle and two of each color. Crumple them up (yes…just do it!) to soften the fibers of the paper a bit then re-stack them in whatever order you like. Punch a hole through the middle using your Paper Piercing Tool and secure the layers with a small brad (I chose a black brad). 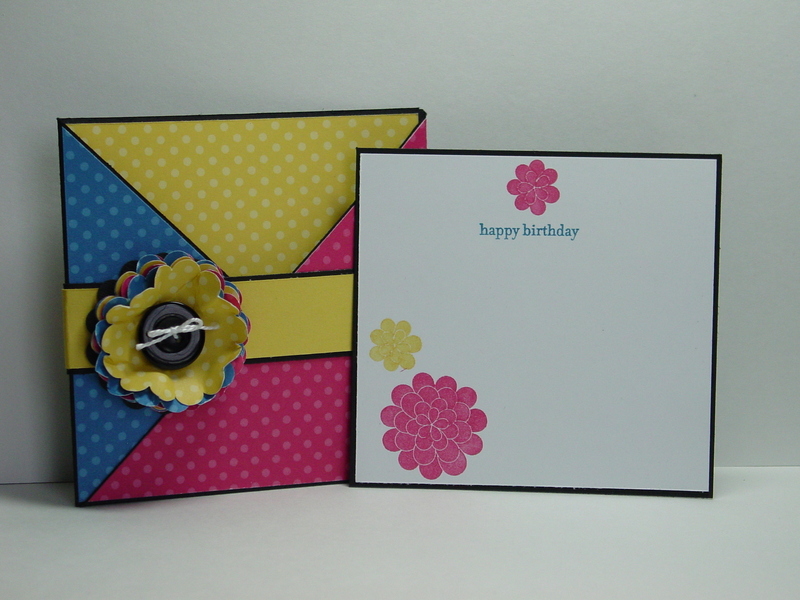 Using a little Sticky Strip (or a few Mini Glue Dots), attach a black button in the middle and put it on your card. The inside of the card pulls right out and has so many fun options. My stampers commented that this would be cute as a party invitation or to hold a gift card. They are so right! I used the flowers from the Apple Blossoms Hostess Set since they match the Scallop Circle flower so perfectly. The sentiment comes from Teeny Tiny Wishes…my go to word set these days, it seems. I am working on the tutorial with all the measurements. If you would like to get that, leave me a note in the comments and I’ll have it out to you as soon as I complete the final details. The Pals Paper Arts PPA89 fashion inspiration this week is flowers. Well, I think this happy flower card fits perfectly! I hope your week has been great and that you get to have some stamping time this weekend. Thanks so much for stopping in today. See you again soon! All products are Stampin’ Up unless otherwise indicated! So pretty! I haven’t made a Criss-Cross card in so long! I love the colors and the patterns you chose! This is so bright and pretty! Love it~! I definitely want the tutorial for this! I love the way it looks! Would either size scallop circle punch work for this? Thanks for sharing all of your cute ideas! I love using the bright colors. The DSP really makes this card POP. 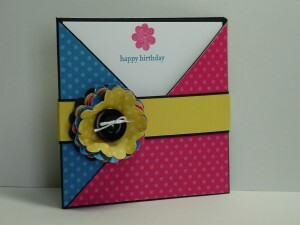 Would love your tutorial for the Criss Cross Blossom card. I love the card, it’s so Spring! I really like all your work, thanks for sharing. How fun is this card. Love the bright and cheerful colors. I would love to see a tutorial on this, thanks. Great fun colors! Thank you for playing along with Pals Paper Arts. Such fun happy colors! Great project! I’m sure the folks attending your classes loved making this. I can’t wait to see the rest of the cards. This is striking! The bright colors on the black it fabulous! I Love this card and would love the dimensions and tutorial. Thanks so much for sharing this!